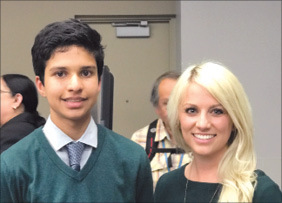 Bullis Charter School eighth-grader Keshav Shah attends the Cities and Climate Change Science Conference in Canada with teacher Michelle Sanfilippo in early March. Bullis Charter School eighth-grader Keshav Shah and a group of fellow student representatives received a standing ovation for the paper they presented at the Cities and Climate Change Science Conference, held March 5-7 in Edmonton, Alberta. Sponsored by the Intergovernmental Panel on Climate Change, the conference was designed to assess academic and practice-based knowledge related to cities and climate change. At the conference, Keshav met with 14 other student representatives from Ghana, Kenya, India, China, Slovenia, Brazil, Colombia, Canada, Mexico, the United Kingdom, Indonesia and Peru. He was the only student representing the U.S.
Keshav and approximately 30 of his Bullis Charter School classmates have participated in the school’s #Decarbonize: Decolonize club since last summer. The purpose of the club is to connect youth around the world to conduct research and develop policy recommendations and action on climate change. Bullis Charter School sixth-grade teacher Michelle Sanfilippo traveled with Keshav to Edmonton for the conference. The student delegation secured a two-hour presentation slot at the conference, where Edmonton Mayor Don Iveson and Alberta Lt. Gov. Lois Mitchell sat in the front row. Keshav and his peers discussed how poor, indigenous populations must be included in the climate change conversation. They advocated for incorporating climate change curriculum in all subjects worldwide and suggested project-based learning as a tool to achieve their goal. The projects would have real-life applications and would connect students with their local communities. The students said school facilities should align with what students are learning in class about climate change by integrating solar panels, green walls and eco-friendly materials. They also emphasized the importance of social media, noting its ubiquitous power to connect youth and spread their ideas about climate change. After their presentation, the students participated with scientists, politicians and city architects in a roundtable discussion. Iveson was so impressed with the voices of the youth that in his closing ceremony speech, he shared their paper with the entire conference. Keshav said the highlight of his trip to Edmonton was working with students from all over the world.